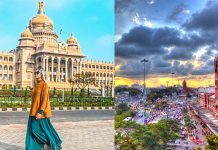 Home Travel Eat What are some themed restaurants in Tamil Nadu? A theme restaurant is a type of restaurant that uses theming to attract diners by creating a memorable experience. 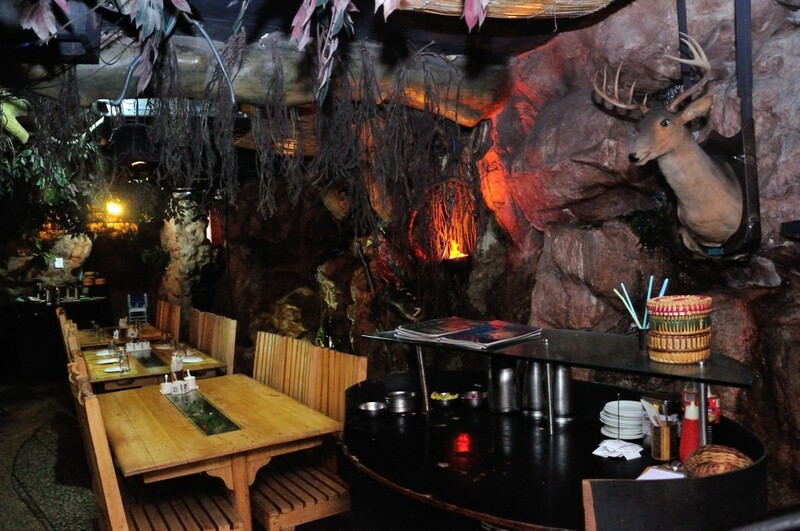 Theme restaurants have a unifying or dominant subject or concept, and utilize architecture, decor, special effects, and other techniques, often to create exotic environments that are not normally associated with dining because they are inaccessible, no longer exist, are fictional or supernatural, or taboo. The theme may be further extended through the naming and choices of food, though food is usually secondary to entertaining guests. This one must be on top of your list! While travelling on a flight, one tends to rush through the meals, without much being spoken about the food etc. 747 in Chennai is India’s first aircraft themed restaurant. 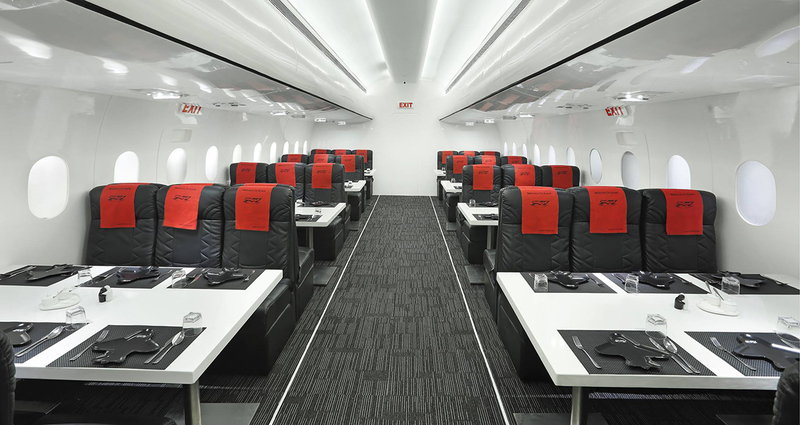 Whether it’s the boarding pass or the seating arrangement, the entire restaurant is shaped like a plane, with an aisle for service. It’s multi-cuisine and renders a complete flying experience. Address: 3rd Floor, Ramaniyam Isha, No. 11,Opp to Sangeetha Hotel, Old Mahabalipuram Rd, Thoraipakkam, Chennai, Tamil Nadu 600097. Opens – 12 pm. Ever wondered what life in a prison would be like? The opening to the cell is a majestic door, where you’re welcomed by waiters who are dressed like inmates. The only difference being that they’re inmates without a cause. The prison steel bars only add to the aesthetic. 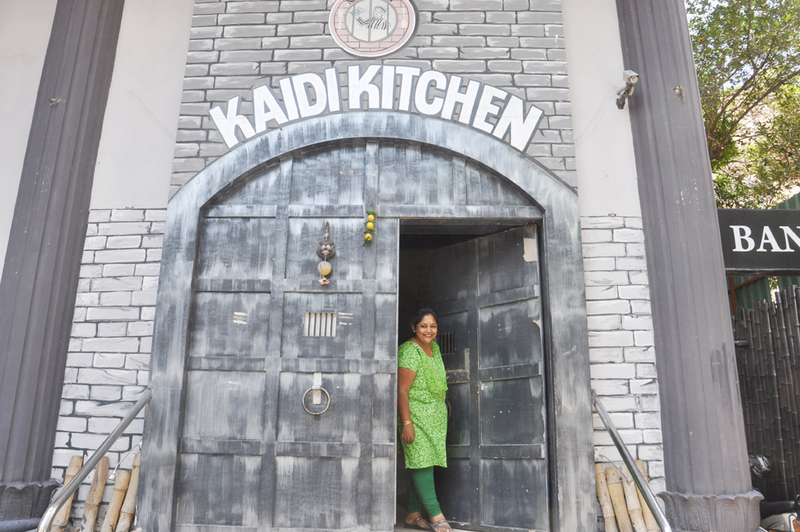 Home to an array of cuisines like Indian, Thai, Mexican and Lebanese, Kaidi Kitchen exhibits a vibe like no other. It’s an exclusively vegetarian restaurant. True to its name, it’s the perfect prison experience. Address: Next to St. Ebbas School, 20/3, Bishop Wallers Avenue East, CIT Colony, Mylapore, Chennai, Tamil Nadu 600004. Opens – 12 pm. A taste of true Gujarati in the heartland of South India. Food that is authentic in a city geographically miles away always is a winner. Amdavadi makes impressive Gujarati food making it lovable amongst the masses. Whether it’s the dhokla or the bhel puri, one feels as though you’re in Gujarat itself. Address: 23/A, N Boag Rd, Beside Kovai Pazhamudir Nilayam, Drivers Colony, T Nagar, Chennai, Tamil Nadu 600017. As exquisite as the name, The Moon & Sixpence is an Irish themed restaurant. 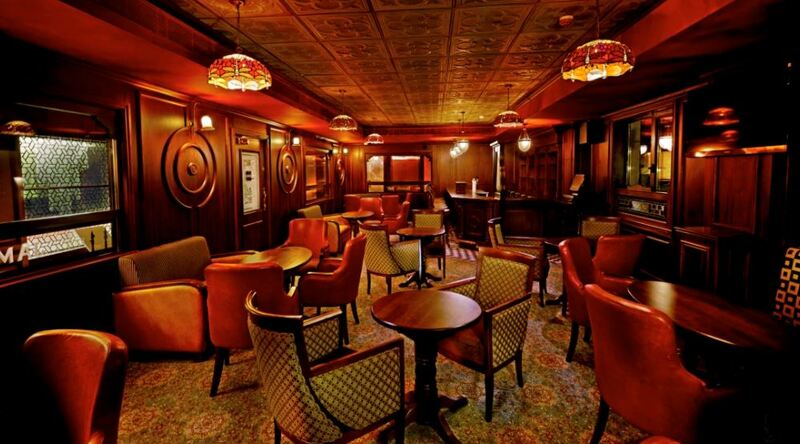 The wooden flooring with an antique bar and the décor makes the place a classy joint. With a plethora of alcoholic and non-alcoholic beverages and a menu that transcends geographical boundaries, the restaurant gives you the feel of an English pub. Address: Guindy Industrial Estate, SIDCO Industrial Estate, Guindy, Chennai, Tamil Nadu 600032. Amidst dense rain and thick forests, you find solace in the Rain Forest. Once upon a time, through the canopy of trees, all you could hear was the chitter-chatter of the birds. Can’t get closer to nature than that, can it? 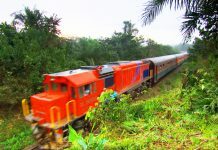 For those hungry for adventure, the Rain Forest is a befitting place. Accompanied by wildlife all around, the experience is real. 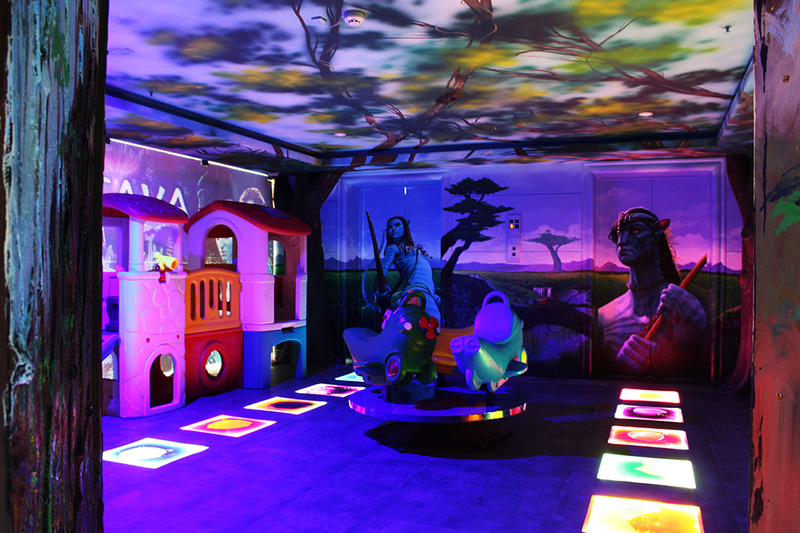 A mix of spooky and funky we’d say! The lavish menu is widespread with a range of options to choose from. Address: 41 & 42, 1st Main Road, Gandhi Road, Gandhi Nagar, Adyar, Chennai, Tamil Nadu 600020. Don’t get too freaked out! Some goosebumps here and there don’t really harm! The environment is eerie, you dine with ghosts and noises. It’s a multi-cuisine restaurant with aesthetics designed to perfection. You might lose a nights sleep, but that’s about it. A number of Tamil films lay behind the inspiration. Address: Block F, F-13, 2nd Main Rd, Block F, Annanagar East, Chennai, Tamil Nadu 600102. 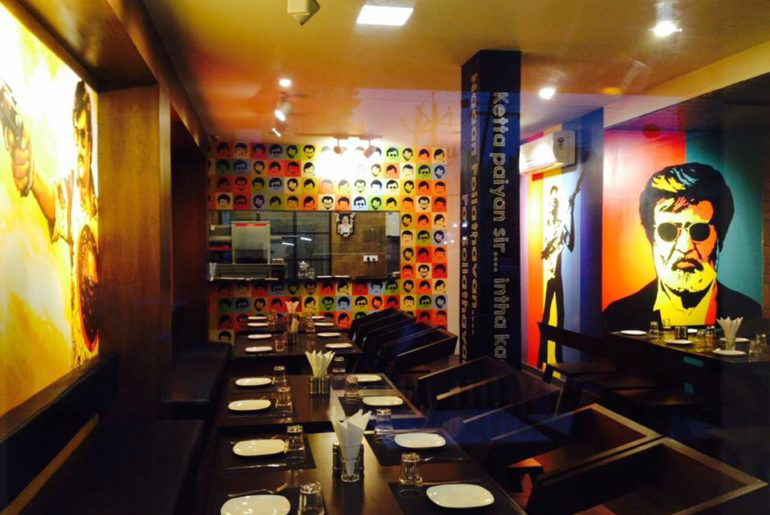 Superstar Pizza in Besant Nagar is a cafe dedicated to the Tamil Superstar, Rajnikanth. With decor and delicacies inspired by the actor, this cafe is a must visit for the fans! Address: 20, 5th Avenue, Besant nagar Beach, Chennai, Besant Nagar, Chennai. Phone: 044 48574004, +91 9894354867. Approx cost: ₹650 for two people. 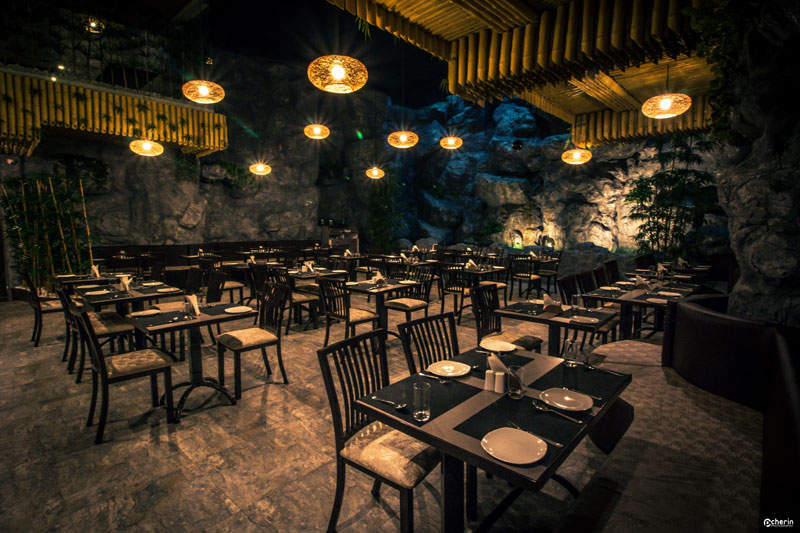 The waterfall restaurant, a unit of Concept Dine-in is one of a kind thematic restaurant in Chennai. The restaurant houses magnificent waterfalls of 20 feet and provides a natural and serene atmosphere for a perfect family outing. Address : No: 18, LV Prasad Road, Dhanalakshmi Colony,, Vadapalani, Chennai-600026, Tamil Nadu, India. 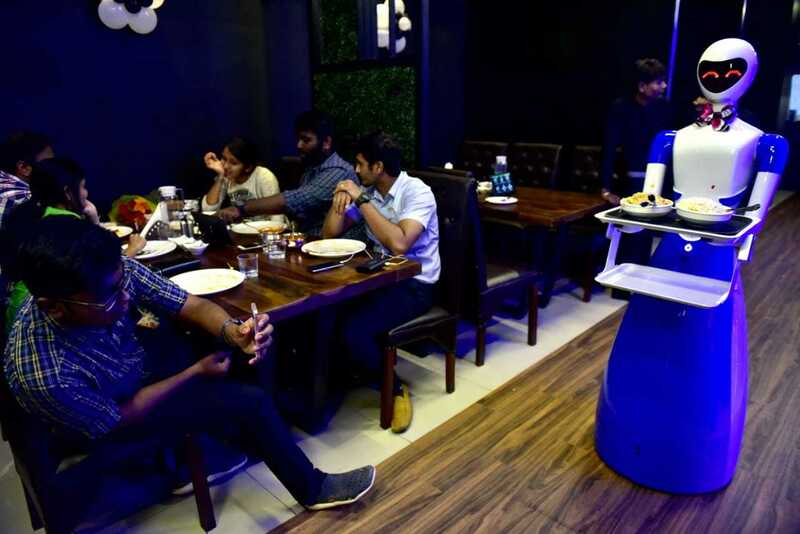 Robot, which opened in November 2017, is India’s first robot-themed restaurant that uses robots to serve food. The restaurant borrows heavily from robot-themed Chinese and Japanese eateries. A second outlet was opened in Coimbatore also. 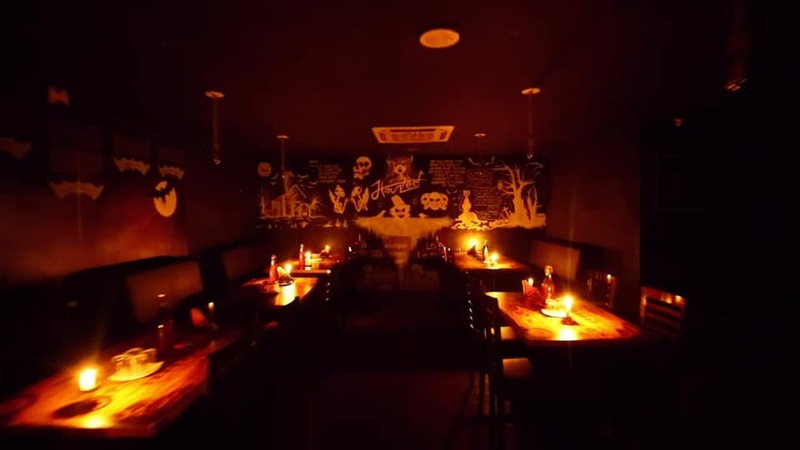 Address : CHENNAI (2 Restaurants) : 208/3, SEMMENCHERI, OLD MAHABALIPURAM ROAD, Chennai, Tamil Nadu 600 119, No 38/1, Mount Poonamallee high road, Venkateshwara Nagar, Mugalivakkam, Chennai, Tamil Nadu 600 116, COIMBATORE : 1078, 1st floor, Senthil Towers, Next to Residency towers, Avinashi Road, Coimbatore, Tamil Nadu 641 018. Experience the movie come to real life, this time in Chennai. With an all blue theme and the exotic lighting, the restaurant resembles a movie set. The furniture is a perfect match, with carved statues to lend a 3-dimensional effect. The multi-cuisine restaurant offers the best of the chef, befitting the theme. Address: 5/9, Arcot Road, Karambakkom, Porur, Chennai, Tamil Nadu 600116. These theme restaurants in Chennai are here to shake things up and give you a dining experience like no other! Different from the regular dining experience, these are sure to make their way straight into your heart.